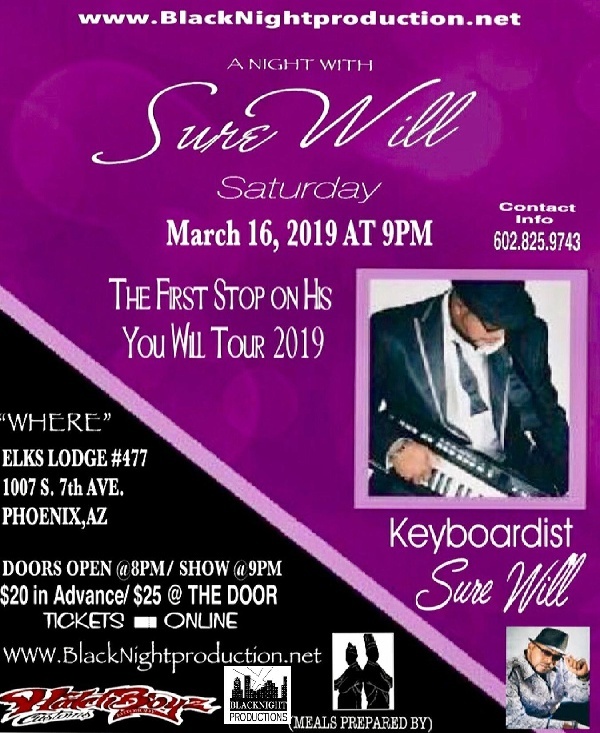 Sure Will 2011 - 2017 Los Angeles Music Awards nominee for “Jazz Artist of the Year” 2011 - 2017 Los Angeles Music Award Winner for “National Touring Artist of the Year” William “Sure Will” Clark Is a dynamic Breakout Smooth Jazz Artist, whose main Instrument is Keyboards. He also plays: Drums, Bass Guitar, Alto Saxophone and Clarinet. His musical resume goes back well over thirty years with humble beginnings playing in the church in Buffalo, New York. A young man influenced by the amazing way George “Chief” Davis skillfully merged a bunch of keys together and the vibe it released. There was no question about it, music was calling him closer. Will picked up “B” flat clarinet in third grade and two years later he was playing, reading and writing on Alto Saxophone. Lengthy Sunday morning COGIC church services had the tendency to put Will to sleep. To avoid the Wrath of Granny and stay awake he started playing the drums for the church. By the time he reached eleventh grade he was playing every instrument, he was by no means one dimensional. His high school music teacher kicked him out of class saying he would never amount to anything because he wouldn’t focus on just one instrument. That statement inspired Will to launch “ToldUSO” Productions, as a tribute to all the people who said he couldn’t do it. Will worked hard in the industry crossing over into multiple genres to collaborate and perform with fellow musicians. Today he is highly respected among peers and A-List artist, for his humility, professionalism and stellar musical talent! He has performed live in some great venues and events such as The City of Carson Jazz Festival, Las Vegas Hilton Annual Awards, The Long Beach Jazz Festival, NeYo and Faith Evans World Tour, JVC Jazz Festival, Newport Jazz Festival. He has also performed multiple times for the following televised award shows: Grammy Awards, American Music Awards, BET Awards, Country Music Awards.